This is one of the best essays I've read about this. Oh give me a break! There is no union busting at KPFA? After management just hired a union-busting law firm and refuses to talk with the workers. CWA doesn’t refuse membership to unpaid workers. Under existing labor law you can get much through barganinig if you are a worker who doesnt get paid. CWA actually met several times over the past decade to see if unpaid workers would join a local of CWA, but it didn’t work out. Seem to me one of those things people say they want, but they don’t want to do he hard work or pay the dues to make it happen. instead, they’ll complain later! It accurately recounts the slow deterioration of the non profit under the previous administration, a failed management/favored clique alliance. The reason KPFA’s unpaid staff aren’t represented by a union (CWA or any other) is simple: the National Labor Relations Board decided they could NOT be represented, after Pacifica’s anti-union management took the case all the way to the NLRB and got the decision they wanted. Yes, the UE contract had included some protections for the station’s unpaid staff, and it is sad Pacifica did this. Still, no KPFA unpaid staff were members of UE or paid dues. The UE contract for KPFA merely included some grievance and reimbursement clauses for unpaid workers. A good thing certainly, but not the mythology of “KPFA workers were represented” or any of this other anti-union crap that is being published to attack the union. That’s just plain old union-busting. KPFA’s paid workers democratically decided to affiliate with CWA after Pacifica launched its union-busting attack. CWA asked to have unpaid protections reinstated, but Pacifica management would not agree to do so. Because of the NLRB decision and its effect on existing labor law, KPFA’s unpaid staff do NOT have collective bargaining rights, so the union can’t represent them. Unpaid staff can, of course, negotiate something themselves “by agreement” with management. So far, they have chosen not to do so. You can check kpfaworker.org and savekpfa.org for more interesting facts, including ones about the financial issues at Pacifica, that you are not getting here. This writer clearly has no understanding of unions, or of KPFA or Pacifica history. First, don’t you remember your basic Pacifica history? Pacifica management “busted” the UE in the 90s by bringing a case to the NRLB to get the unpaid staff removed from the bargaining unit. They won. Unfortunately, the result of that legal decision was that unpaid staff no longer have any collective bargaining rights. It’s been that way for over a decade. Whether the paid staff are represented by one union or another is their choice. They democratically chose CWA because it was a stronger media union in the bay area, whereas UE didn’t even have a local office nearby (deindustrialization had shrunk it badly in the 1990s). CWA is one of the most democratic unions in the labor movement, and represents many media workers across the nation. Second, KPFA’s paid and unpaid workers can endorse whomever they like in local board elections just like any one else, and most have clearly chosen SaveKPFA. That group won more seats than its competitor (which some other staff endorsed). So what? In classic Pacifica fashion, listeners and staff are both concerned about the station and work together on many projects. That doesn’t mean staff “control” the board. And far from “dismantling community oversight,” SaveKPFA is a broad coalition rooted in the community. Thousands of its supporters have written, demonstrated, and pledged their backing for change at Pacifica, and voiced their outrage at what the current Pacifica administration, embodied by executive director Arlene Engelhardt, is doing to the station. Third, KPFA’s funds have been “massively mismanaged” but not by the people the author accuses. See http://www.SaveKPFA.org and click on “FACTS ON KPFA’S CRISIS” at the top for the true story behind the financial shenannigans of Pacifica’s current national board and its affect on KPFA. Incompetent board members and managers like LaVarn Williams and Arlene Engelhardt are at the root of the network’s troubles. 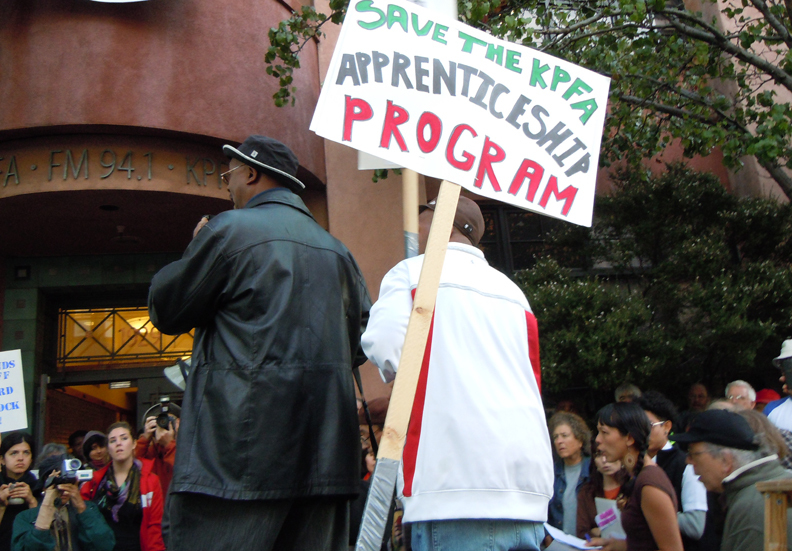 You can also find lots of interesting information about KPFA at http://www.kpfaworker.org . Fourth, the author states, “Many people now refer to the managing faction of the still unionized workers as the ‘entrenched staff’, and some call the CWA a ‘scab union’. From the start the CWA played the divisive role of an elitist private club, rather than that of a union.” Nope, afraid not. The only people who use these kinds of nasty, union-busting terms are this author and a few friends who are pissed the lost a majority on KPFA’s board. The station’s workers, like others around the world, made their choice of union and are quite committed to it. Look, there are about 35 paid workers at KPFA, all members of the union, all have a vote. Managers are not part of the unit. There are a handful (4 or so) department heads who do daily non-managerial tasks at the station and are part of the unit. The rest of the 30 plus workers are techs, bookkeepers, on-air programmers, subscription database people. Kinda like most unionized employees around the nation. As far as being “entrenched” — what a loaded term — there are tons of unpaid staff who have been at KPFA for decades. Aren’t they “entrenched”? How come Dennis Bernstein — rather “entrenched” no matter how you define it — is never accused of such by his admirers? Fifth, “Unpaid staff represented by the UE were entitled to such benefits as travel expenses and childcare.” Yes, before Pacifica took its case to the NLRB and busted the UE, that was true. However, did you know the childcare reimbursement was only about 10 cents an hour? Wow, hate to lose that benefit! The travel reimbursement still applies; any unpaid staffer can get it. Sixth, as far as UPSO being “the closest thing to a union for volunteering workers,” well maybe, theoretically, if it actually had participation from a broad range of unpaid staff. It doesn’t. UPSO’s leadership has been so poor they could not even run a proper election for years. Three or four people making decisions in the name of 150 unpaid staffers isn’t acceptable, which is why management de-recognized it at one point. Seven, the author writes: “they are refusing to comply with the very union contract, that was negotiated on the backs of their sacrificed fellow workers.” Who’s refusing? There is no union contract for unpaid staff, and there hasn’t been for over a decade. Pacifica ensured that when it engaged in union busting in the 1990s and took its case to the NLRB to toss the unpaid staff out of its bargaining units and won. CWA asked at the bargaining table to have unpaid rights included; management refused. CWA also held a series of meetings unpaid staff and welcomed them to organize back in the 90s. Unpaid staff decided the interest was not there. The “deep division within KPFA” this author dreams up doesn’t exist. Most people at the station work productively together and are respectful of differing opinions. The “paid union bureaucrats” that this author refers to also don’t exist — the KPFA local is all-volunteer, with members giving of their time to make the union work. The “deep division at KPFA” has nothing to do with the union, it has to do with ignorant outsiders like this writer tossing around ridiculous unfounded accusations and rhetoric for their own political purposes, with no knowledge of the KPFA situation or its history. The reason KPFA’s unpaid staff aren't represented by a union (CWA or any other) is simple: the National Labor Relations Board decided they could NOT be represented, after Pacifica's anti-union management took the case all the way to the NLRB and got the decision they wanted back in 1999. When that decision was rendered, the parts of the UE contract that had included some protections for the station's unpaid staff were made invalid. Even before that, no KPFA unpaid staff were members of UE or paid dues. The UE contract for KPFA merely included some grievance and reimbursement clauses for unpaid workers. A good thing certainly, but not the mythology of "KPFA workers were represented" or any of this other anti-union crap that is being published to attack the union. That's just plain old union-busting. By the time KPFA's paid workers democratically decided to affiliate with CWA in 1994 after the UE contract had expired, unpaid staff protections were long gone due to that NLRB decision. CWA asked to have unpaid protections reinstated, but Pacifica management would not agree to do so. Because of the NLRB decision and its effect on existing labor law, KPFA's unpaid staff do NOT have collective bargaining rights, so the union can't represent them. Unpaid staff can, of course, negotiate something themselves "by agreement" with management. So far, they have chosen not to do so.